On May 2nd a mother pigeon laid the first of two eggs. 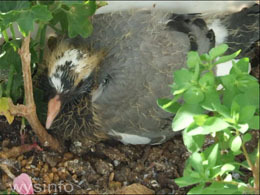 The mother and father pigeons took turns sitting on the eggs for a period of about 16 to 18 days – the typical period for incubation for pigeon eggs. The mother lays the second egg on May 4th. Typically pigeons lay two eggs within a one to two day period. Their nests are flimsy. Both mother and father sit on the eggs – but in the early stage of the baby’s life the mother is the primary protector. Later, the father becomes more dominant. One egg hatches some time on May 18th. Pigeons are born blind, as you can see in the video. Look carefully on the ground just beside the baby. The baby in the second egg did not survive. Shortly after this video was taken, the dead sibling was removed by the parent pigeons so it would not interfere with the new born. When only one egg hatches with a live baby, that baby receives all the pigeon (crop) milk that would have gone to the two eggs. In the beginning both parents sit on the new squab. It seems like the mother is not willing to leave the baby unprotected – but eventually she goes to look for food and leaves the baby under the father’s supervision. The father is not as conscientious as the mother. The slightest noise sends him flying. In just one short day the baby pigeon starts to change color. The underlying skin changes from pinky to black. The feathers also change from pink fluff to wheat colored hairs. In this video you see the baby, a few days old, with a twig scratching against its neck. 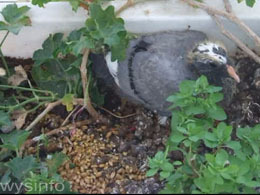 Still blind, the baby doesn’t move around much but – as you can see in the video – when in trouble the squab works hard to solve problems by itself. The baby has been left alone for a short period. At this stage the squab can’t yet move around too much, but it does eventually free itself from the irritating twig. Later in the day the mother returns to the baby. We don’t see her feeding the baby pigeon here, but you will see a good example of feeding in other videos. During the first few days the mother continues to sit on the baby to keep it warm and protect it. At this stage the baby tries to walk. You see in this video that it uses its wings for balance. The young squab has to learn to walk – it doesn’t happen without practice. Excited at the prospect of food, the baby pecks wildly at its mother – but the mother is tired and not keen to feed. The baby is now more mobile and much more active. It wants to eat, but the mother pigeon does not give in to its insistent pleading. Watch the video carefully – at a certain point the mother even pushes the squab away with her wing. The baby looks gawky. Its neck, without feathers, appears long and gangling. The squab is now too big to fit comfortably under the mother and is left alone more often. In three short days the baby already developed new feathers – with patches of soft white on its head and back. The young pigeon now has beautiful new white and black feathers. In this video the baby remains still within its protected home, but we see that it is becoming very aware of itself. Maybe it’s even proud of the new feathers – or maybe they just itch. There is not much action in this video, but we see how the baby is changing. June 1st – Father dropped seeds on the ground to teach the baby to eat. June 2nd – The baby finally tried to eat the seeds. For a long time the baby ignores the seeds that the father brought for it. The seeds are usually partially digested , but this baby pigeon still prefers crop milk and only nibbles. Two more days pass and the baby is looking more like a little pigeon – but there are still tufts of brown hair tucked between the feathers. The life of this young squab is clearly focused on a few important things: Its new feathers and waiting for father to come and feed it. Watch how it stretches its wings – getting ready for the next big change in life…. The baby is not yet ready to fly, but is much more active. You can see in the video above how agitated the baby is while waiting for the father to come. Three days later, early morning, the young pigeon is waiting anxiously for breakfast. We see in the video how the squab senses that the father is close by and becomes very excited. When the father arrives he feeds the youngster. The young pigeon is anxiously waiting for the father – looking in all directions. The youth is hungry but the father seems to have other things on his mind. He only feeds the youngster for a brief period and then pulls away. It seems as though the father is trying to coax the squab into following him – but this little pigeon is not yet ready to leave the nest. The squab is now about 3 weeks old and is approaching the age when it should learn to fly. The young pigeon is now spending most of his time cleaning and preening its feathers, stretching its wings, walking back and forth within its protected home and preparing mentally for the next leap in its life, which is both exciting and unknown. The process of learning to fly includes stretching and exercising its wings while it anxiously waits for the father. The young pigeon does not make its first flight without the father beside it. Unfortunately we did not catch the very first take off. However, we were lucky to catch the squab and father’s return from the first attempt. The level of excitement that you see in the video speaks for itself! Watch while the young pigeon comes back from this first (short) flight and climbs back up to its home. This little pigeon has never been so excited – with the realization of the freedom and new worlds that it is about to discover. As we watch the father with the squab we realize that the father must continue to coax the young pigeon into flying again. We see the young pigeon sensing that the father is somewhere close by. It searches anxiously in all directions…and sure enough the father arrives. Having tasted the thrill of flying, this young squab is very stimulated – but not quite ready to venture out on a solo flight. The squab is excited about the new world of flying – but is still not ready to go out on its own. The father appears to be trying to coax the young pigeon out of the nest by limiting the feeding to short sessions and then pulling away. In the beginning the father is standing on the lamp post a few meters from the young pigeon. It is early morning and time to eat. The squab is restless while waiting, and seems to realize that the father is close by. At the end of this video the father flies back to the post – perhaps waiting to see if the squab will follow. Eventually, as we knew it would, the day comes when the young pigeon finds the confidence to fly all by itself. You are watching the first solo flight of our young friend. Eventually the squab comes back to the nest – true to its homing instinct. The mother pigeon is already incubating two new eggs very close by and the day will come when the squab, its father and a new young sibling will all fly together.